For the past decade millions of customers around the world have known that Dr. Patrick Flanagan's patented product Crystal Energy will pull toxic metals out of your system. Crystal Energy encloses the toxins in his revolutionary nano-sized (that's 1 billionth of a meter) Flanagan Microcluster®. The process works by tiny little spheres made of silica that literally encapsulate the toxic metals. Once enclosed, these toxins are rendered harmless and then your body can naturally dispose of them. The disposal process is made even easier because water with the Flanagan Microcluster® hydrates semi-permable membranes (i.e. your cells) 6 times faster than regular bottled and tap water without it. THAT MEANS THE TOXINS GET OUT FASTER AND THE NUTRIENTS GET INTO YOUR CELLS TO AID REPAIR. The quality of the water you drink has a profound effect on your health and well-being, and Crystal Energy® improves your drinking water ability to hydrate your cells -- and it tastes great! 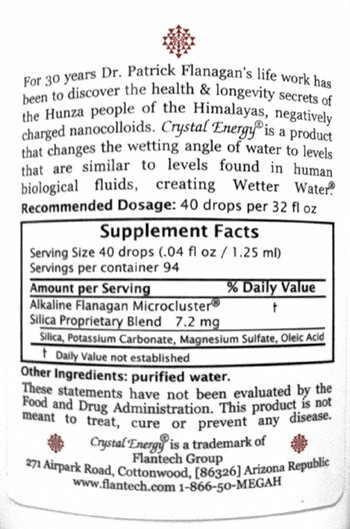 The basis of all three products, MegaH, MegaHydrate, and Crystal Energy, is Dr. Flanagan's patented silica Microclusters® which provide numerous features such as increased hydration, increased zeta potential of cells to clean the blood, alkalizing of blood, and detoxification. The benefits of silica Microclusters® are increased energy, an enhanced immune system, pain relief, and a longer, healthier life. After developing the silica Microclusters®, Dr. Flanagan found out a way to capture active hydrogen (or negatively ionized hydrogen) inside the silica. This is called silica hydride. Silica hydride provides the benefits of the plain silica Microclusters® PLUS active hydrogen. Due to the active hydrogen, silica hydride is now the most powerful antioxidant known. The benefits of powerful antioxidants are substantial. MegaH and MegaHydrate both have silica hydride, but MegaHydrate has 50% more silica Microclusters® than MegaH. This means that MegaHydrate provides more hydration capacity than MegaH due to the increase of silica Microclusters® used in it. However in terms of silica hydride, MegaH and MegaHydrate HAVE THE SAME ANTIOXIDANT CAPACITY per capsule. That means that both MegaH and MegaHydrate have the same amount of active hydrogen, but MegaHydrate is a more powerful hydrator. As you can see from the chart below, all three products alkalize the body, but Crystal Energy assures that all the water you treat with it will alkalize your body (or move more acid if that is your body's requirement). When taking MegaH or MegaHydrate, it only balances the pH of the water around the time you take the capsules. Plus if you have children, pets, or others you want to get the incredible health benefits of the silica Microclusters® without having to take a capsule, Crystal Energy is a very convenient way to do that. The ideal program is to take either MegaH or MegaHydrate daily AND add Crystal Energy to all your drinking water. Not only will the water taste great from Crystal Energy, but it will hydrate you to maximum benefit and get the antioxidant power of MegaH or MegaHydrate. What MegaHydrate Does Megahydrate (also marketed as microhydrin, but MegaHydrate has 50% more microclusters which enables greater hydration) is a powerful antioxidant and provides full-body essential hydration for optimal health and well-being. Try Megahydrate To Experience How Good Hydration Re..